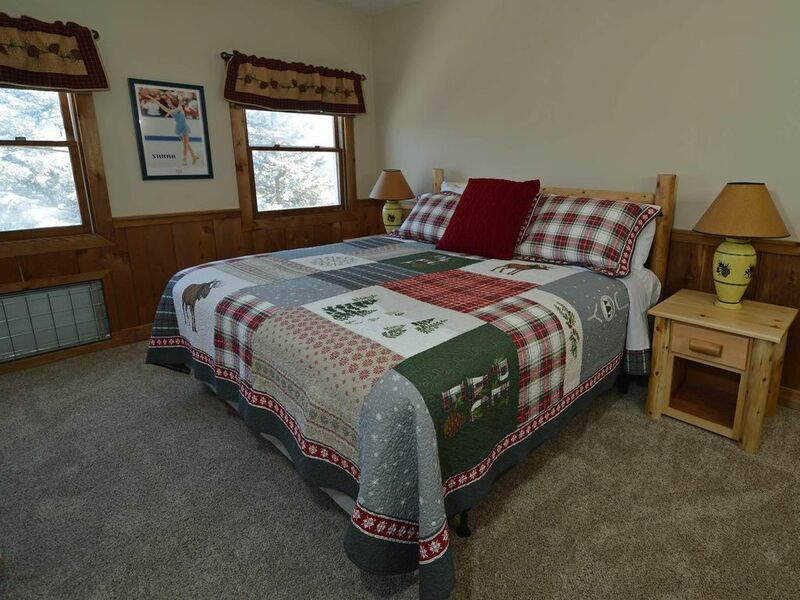 4 BEDROOMS, 3 BATHS: Ski In / Ski Out, Wood Fireplace. Major upgrade in fall of 2017. Ready for Snow Season ! MASTER Bedroom: Pillowtop King Bed, TV, Private Full Bath. Bedroom # 2: Pillowtop King Bed. TV. Top Floor. What a view ! Bedroom # 3: 1 Twin Bed and 1 Pyramid Bed (Double down, Single up), TV. Full Bath outside your bedroom door. Bedroom # 4: Kids Bunk Room and Movie Theatre. 60" flat screen TV, BluRay DVD, Sound Bar. 2 sets of Pyramind Bunk Beds. Awesome place for the kids to hang out. PLUS: Free WiFi, Free Long Distance, Ski Storage Area, Living Room and Deck overlooks the slopes. AMENITIES: Great Room with Loft Ceilings. Washer/Dryer. Ready for your arrival with top quality linens, lots of towels, paper goods, soaps, detergents. Complimentary full bag of STARBUCKS Coffee for you. Popcorn for the kids. LOCATION: Park at your door. Sits beside Whistlepunk Trail, a Novice run leading to the entire trail system. 2 ski lifts within 100 yards. Across the street from the Double Black Diamond trails of Western Territory. A 5 minute walk south on paved walkways to the Village Center, Split Rock Pools, ski school, and our favorite Village eatery, The Foxfire Grill. ENJOY: Ski chalet feel with a wonderful floor plan for 2 families with a bunch of kids. Two master bedrooms, one upstairs, one down. Upstairs movie theatre and bunk room is a big hit with all the kids. They love a place of their own. Lots of room, great location. The condo was very roomy. It was a great location. Clean. Had everything we needed to cook our meals. The fire place was awesome with plenty of firewood for us to use. We stayed in this property February of 2019, and it worked out perfectly for 11 adults. Plenty of space to spread out and everything we needed. stepped right out of the door to hit the slopes and able to make the easy walk to restaurants and shopping. The property is right across the street from the Western Territory and shuttle stop if you want to quickly get down to Silver Creek.